When I first read about how difficult it was to do Yolo county's highpoint, I thought, hmmmm, maybe I'll save it for one of the last ones I'll do if I try to do all of California's county highpoints. When my friend Dennis Poulin came back from doing it, he was pretty beat up. I consider him to be one of the strongest hikers I've ever met and when I heard from him that Yolo was pretty bad, I crossed it off my to do list. Another friend, Adam Helman mentioned that if it were his choice, he'd save Yolo for the very last since there would be no really good reason to do it unless I was intent on doing all of California. Still, in the back of my mind, I kept hearing the words "Yolo, Yolo, Yolo....." LIke a siren song, I knew I wanted to do it. I am a glutton for punishment sometimes and the fact that it was so nasty made it attractive to me. I am also somewhat unbalanced so that should explain it a bit better. Well, part of a year went by from the time Dennis first did it (April 24) and I got an email from Dennis asking if I wanted to join him on a trip to another highpoint in the area. I said, I'd love to join him but I also wanted to get Yolo crossed off my list, would he join me (help me would be a better word since he knew the route) on doing it. Yes was the answer from Dennis, who had vowed never to set foot in Yolo county again (heh heh) but we had to accomplish it on the 4th since we had an appointment with Loro Patterson on Dec 5th to do San Mateo's county highpoint, a tough one to get since it is totally on private property ( Loro has the landowners permission to take a group into it once a year, generally near Christmas time). It is also a good time to pick up Santa Cruz's county highpoint which happens to be on a Christmas tree lot and is only open in December. Thanks again to Loro for helping many of us to get San Mateo but back to Yolo. I made arrangments to catch a flight out of Portland, a three hour drive from my home in eastern Washington and flew down to Sacramento where I rented a car on the 3rd of December. I met Dennis, who had driven down from his home in Medford Oregon, near the small town of Colusa and together the two of us picked up a county highpoint that was nearby. Finishing our effort on that one about 8 pm, we drove up to Lower Lake and found our way up to a place near the BLM TH and car camped at a nearby spot. During the night, Dan Baxter from Fresno drove in and parked next to us. In the morning, we drove back down the road to where the TH is, which is not much more than a spot on the shoulder of the road. As we were ready to go, Chris Doig from the Danville area drove up and we had our quartet of hikers assembled for the challenge ahead. As we crested the jeep road, we had our first view of Little Blue Peak. It looked pretty much like most of the small peaks you see in the area but had the distinction that set it apart from those other bumps, it was the highest point in all of Yolo county. Looking down the road, the brush was pretty obvious, it was everywhere. Dennis had been down that road to where it ends and the BLM trek really begins and his written trip report is a must read and I'll leave that story for him to tell. His experience with this area saved us big time and after you read this and then his trip report, you'll see why. Off to our left we could see a house, seemingly out of place in this wilderness of brush but Dennis pointed towards it and stated that that was where we were headed. What? We weren't dropping down the jeep track to the BLM jungle? Nope, we were headed to the house. Between us and the house was a quarter mile of the thickest brush I had ever seen. Our real objective was a clearing to the east of the house and it took us a good 35 minutes to get there. We first dropped off the jeep road, down into a ravine and up the other side, working our way always toward the clearing which when we finally reached, was like heaven. Now we had taken this route because Dennis had a secret that none of knew going in, he knew one of the homeowners of the house. About the time we hit the clearing we could hear the dogs. A little concerned about the dogs, we looked at Dennis and he had a little smile that we learned to appreciate a bit more. He knew the dogs. Yes indeed, he even knew their names. As we made our way towards the house (easy walking now), the dogs barking kept increasing. Upon finally seeing the residence, I could see a man outside looking our direction. Two dogs started charging towards us and as they got fairly close, barking and snarling all the way, Dennis called them by name and that defused them and settled them down. A third dog, a big white one was chained up and that turned out to be a good thing (in my opinion). Dennis was known by the homeowners as the "Oregonian". 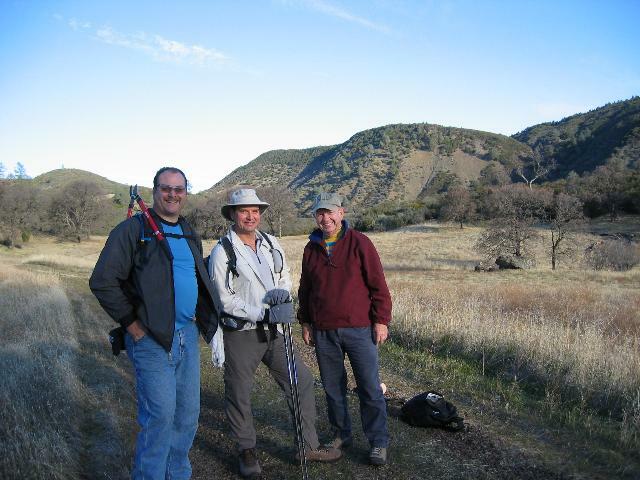 It seems Dennis had met one of them on his first Yolo county effort and had taken the BLM route going up. Battered and out of water, he opted to return on the private property to the south rather than face the nasty brushfest on his return and take his chances with the homeowners. Fortunately, his battered and bleeding appearance and request for water was met with compassion and he had a great visit with one of the homeowners who not only took pity on this poor beat up county highpointer but even liked him (amazing) and hence the name he was known by was born, The Oregonian. He was told that he would always be welcome if he chose to return and that was the secret he shared with us as we headed for the property a little earlier. These homeowners also own the land that is the bit of private property that is crossed on the BLM route. They have no problem with people crossing their land down in the creek drainage and rarely go down there themselves. They felt differently though about people crossing their land elsewhere as I will point out. Dennis had a nice reunion with the homeowner that knew him and the three of us, Dan, Chris and myself were welcomed as well to cross their property, only because we were with "The Oregonian" (isn't that the name of the Portland newspaper?). They also welcomed us to return via their property and when I queried them about other county highpointers doing the same, they nixed it. They had even met Gary Suttle and had turned down a similar request. Since they are fairly isolated out there, they prefer that strangers not cross their land. Their dogs may not take kindly to strangers and they don't like to keep them chained up. It turned out that they had chained up the big white when the other two dogs started barking upon sensing our presence while we were working our way through the brush. Thjey related several stories to us about previous hikers but no matter how I asked the question, the answer was no to having people (other than ourselves crossing their property) We met them again, the dogs as well, on our return later on. The road beyond their house is a decent gravel one and we followed it downhill for a bit, taking it north and then northwest. We saw several small white faded signs that didn't seem to make any sense since this was private land. The road forked with the right fork heading downhill into some trees but we took the left fork and followed it uphill. Eventually we came to a locked gate with a couple of very faded "No Trespassing" signs and 3-foot-deep eroded rut that rendered the road useless (for any street-legal motor vehicle) beyond that point. Beyond the rut, the old jeep road continued up hill to a point where you could see another residence off in the distance. The first homeowners had warned us that the guy that lives there does not take kindly to trespassers so we hunkered down and tried to make ourselves invisible as we skirted the northern perimeter of his land. The road soon faded into a series of rolling grassy hillsides. We worked our way over to another jeep road and up toward Butte Rock, that lies roughly about 1.5 miles SW of Little Blue Peak. We followed the jeep road that went north of Butte Rock and headed uphill and eventually led to a saddle at the top of the jeep road. From there we were looking directly north at Little Blue Peak, and the jeep or firebreak road dropped steeply down to the final saddle before wrapping left steeply up the road to the northwest. About half way up the road, the vegetation began picking up again and at this point the road became mostly overgrown with sharp, thorny brush. Where the road (such as it is) crests, the road goes uphill to the left but what we took was a trail that took off to the right and headed straight up towards the summit area of Little Blue Peak. This trail is badly overgrown and Chris put his loppers to good use cutting off the overhanging stuff. About a quarter of a mile and fifteen minutes put us on top of the peak and the summit was pretty much overgrown where a cairn with a metal register box marked the summit. However, just to the east of the summit, it opened up a bit so you could get some nice views of the surrounding area as well as views to Mt. St. Helena to the southwest and Lowery Peak to the southeast. We had a great view of our whole route and I was pleased to sign my name in the register and review the names and entries of previous visitors. This peak gets very little visitation. It was about 4 1/2 miles to the summit and it had taken us less than 3 hours, about half of that mentioned by others who had taken the legal BLM route. Had it not been for Dennis having been there before and knowing the landowner, we would have taken much longer, much much longer. .
On the way back on top of the jeep or firebreak road below Little Blue Peak and before we got to the downhill before Butte Rock, we met two ATV's with three people who were scouting for deer in the area. They had come in from another road which looked like there was a cabin or structure we could see from where we were at. They were friendly and didn't ask us about being on private property which perhaps we weren't at that time. It is hard to tell where BLM land begins and ends but these three were locals who asked us if we had been up to the "metal box" on top of the peak. Evidently they have run into others who seek after the thrill of summitting Little Blue Peak. We made our way back the way we came, making it back to the homeowners where we once again talked for about fifteen minutes. They also mentioned that they often saw bears in the area. We made it back the way we came and soon the dogs started barking, letting the people in the home know that we were heading their way. Both came out to greet us and offer some water and to hear our successful summit report. The homeowner confessed that he had been reading reports on the cohp.org site and that it bothered him to see that some would knowingly tresspass on private property without authorization. I asked him if people could email him for this permission and he answered "no", he really didn't want people he didn' t know on his property. There is always the liability issue and while he knew that the BLM route was nasty and all of that, he was steadfast in not wanting strangers on his land. He and his wife were very hospitable to us but he was very clear on this issue. He mentioned that he had met Gary Suttle a few years earlier and Gary had asked for similar permission but he also had turned him down. Of course, I wouldn't want that white dog coming after me either so enough on the private property issue. My recommendation is that we keep working to improve the BLM route, perhaps with the help of the BLM (yeah right) and every time anyone goes by this route, take loppers and make a contribution to the effort. Dingus Milktoast commented that the easiest way to do the BLM route is to stay in the streambed. The way out via the brush was easier going downhill and total time, including the chat with the homeowners was under six hours for both ways. 9 miles round trip with close to 2000 feet of elevation gain. Be sure and read the Trip Report posted by Dennis as it gives you the background on this one in a more negative but accurate rendering. After we got back to the TH, we drove down to Lower Lake where I treated Dennis to a well deserved meal at the local DQ. From there we went on to do the county highpoints of Marin, San Francisco, San Mateo and Santa Cruz counties. I finished off with a visit to the highpoint of Contra Costa county, Mt. Diablo. They should rename Little Blue Peak to be Mt. Diablo, it is more fitting. I flew out the next day and headed home but Yolo county's highpoint will be one I'll never forget and yet, I had it easy, I didn't do it by the BLM route.